Village Crest in Ellicott City, Maryland consists of 55+ residences within the master-planned community of Taylor Village. Residents have access to two community centers, one of which services residents of all ages throughout the master-planned community and the other is for 55+ homeowners only. Village Crest is comprised of mid-rise condominium buildings and attached villa homes available on a resale-only basis. Homeowners enjoy living in low-maintenance homes with neighbors who share the same interests and hobbies. Village Crest is an amenity-rich active adult neighborhood within the master-planned Taylor Village community. The Taylor Village Community Center is open to all residents. The center offers an exercise room, three outdoor pools, two tennis courts, and a playground for grandchildren. 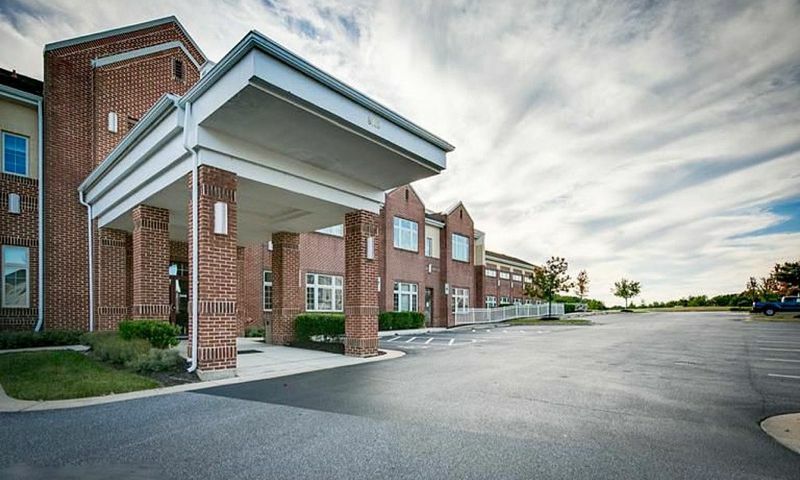 Seniors living in the community have access to year-round private amenities at the Taylor Village Senior Center. This clubhouse is equipped with an exercise room, indoor pool, and dance floor. Here, 55+ residents enjoy meeting in the gathering room, card room, and multi-purpose room for clubs and activities. With a catering kitchen, billiards, computers, and a library, residents can always keep busy. Village Crest encompasses 406 low-maintenance residences built by Ryan Homes between 2005 and 2010. The Hearthstone neighborhood consists of 288 condo units situated throughout 18 mid-rise buildings. Each condo unit offers approximately 1,330 to 1,574 square feet of living space with elevator access and a private patio or balcony. Most units offer two or three bedrooms, two bathrooms, with parking in a lot. The Legacy neighborhood consists of 118 attached villa homes that feature a first-floor master suite and basement. With 2,100 square feet of living space, the Griffin Hall floor plan offers three bedrooms, two-and-a-half bathrooms, and a two-car garage. Village Crest s activities coordinators are responsible for creating activities and events for active adult residents. The senior center offers a variety of social activities that include potluck dinners, painting classes, holiday parties, and workshops. Staying fit is easy with yoga and water aerobics classes designed for active adults. Residents continually plan fun neighborhood events and trips throughout the year. Village Crest is located in Ellicott City, Maryland, approximately 17 miles west of Baltimore and eight miles northwest of Colombia. With easy access to Routes 100, 29, and I-29, Village Crest enjoys a convenient location in Howard County. Ellicott City is filled with historic attractions, multiple dining opportunities, and recreational activities. Residents enjoy living near numerous shopping centers throughout just a few minutes away. Village Crest is a wonderful 55+ community in Ellicott City that offers a variety of homes in a central location. Taylor Village Community Center services the master-planned community. Taylor Village's Senior Center is a separate age-restricted clubhouse for active adult residents. There are plenty of activities available in Village Crest. Here is a sample of some of the clubs, activities and classes offered here. Village Crest's condos are found in the Hearthstone neighborhood. Each unit offers approximately 1,330 to 1,574 square feet of living space in mid-rise buildings. Most units offer two to three bedrooms, two bathrooms, and a parking lot space. Please Note: Floor plans are not available at this time. Low-maintenance attached homes are offered in Village Crest's Legacy neighborhood. At 2,100 square feet, these townhomes offer three bedrooms, two-and-a-half bathrooms, and an attached two-car garage. The basements provide space for entertaining or storage. I bought my condo here in 2010 and have been very pleased. The community and clubhouses are very well maintained and the staff is great. There is always something to do and I've made really good friends here. I try to be active in the community but I'm also very busy just spending time with my new friends, shopping, traveling and enjoying dinners out with friends. It's been a great move for me. 55places.com is not affiliated with the developer(s) or homeowners association of Village Crest. The information you submit is distributed to a 55places.com Partner Agent, who is a licensed real estate agent. The information regarding Village Crest has not been verified or approved by the developer or homeowners association. Please verify all information prior to purchasing. 55places.com is not responsible for any errors regarding the information displayed on this website.